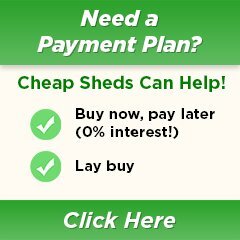 The Cheap Sheds range is by far the best value you will find instore. You are getting the best Australian made products at more affordable prices. We can offer this because it’s our very own brand! Our products are Australian made and designed for Australians. They are built to endure tough weather and won’t fade, rust, dent or peel. You can select from a popular selection of sizes and styles. Despite the fact, they are made from high tensile steel and will last a lifetime we still offer a 15 years warranty to give you peace of mind.